Take a chance and follow! Enter your email address to get my posts in your email. I was going to start this post with the ‘Lets not talk about what I ate for dinner’ but apparently I did something right because I lost another pound between the fast and my weigh in day. We can still continue with the ‘lets not talk about what I ate for Christmas Dinner’, but it’s moderately useless, because it was SOOO GOOD! I’ve decided not to punish myself for eating good food. It’s destructive and isn’t good for me. So, I’m simply going to look back at my epic meals (both Sunday and Christmas) and say thank you to the chefs and creators of the three amazing meals I’ve had this past week. 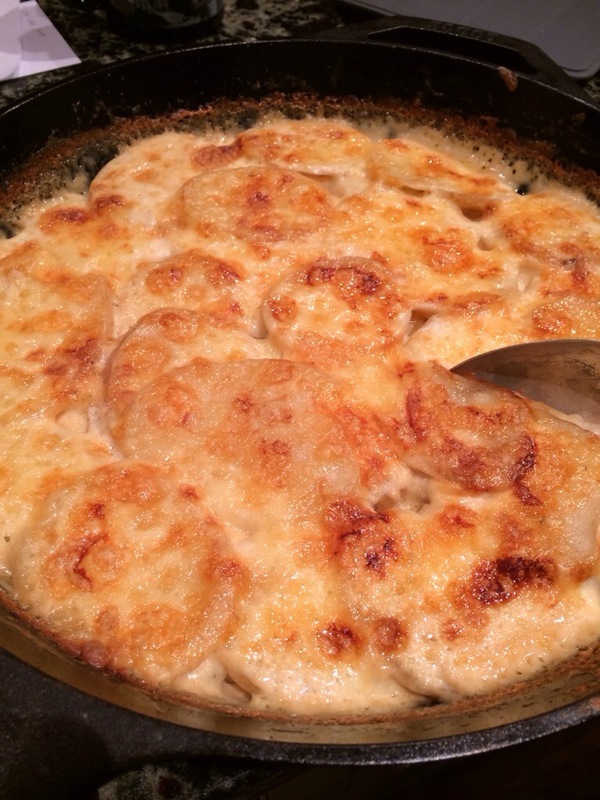 Scalloped Potatoes in cast iron skillet. There is honestly no good way of avoiding eating the food and no good way to describe how fantastic they were. And for me to be able to take a step back, appreciate the good food and NOT feel guilty about having eaten it, is huge. It used to be that I would eat a wonderful dinner (with calories) and then feel guilty because it wasn’t on plan (because it so wasn’t) and that I barely paid any attention to portion sizes (because I so didn’t). But I can’t do that anymore. It’s destructive, like I said before. Because lets be honest. We generally don’t think about our diets at the holidays and then when the gifts are opened, the meals eaten and cookies gone, we all feel guilty about having indulged. And that guilt drives us to eat more bad food and continue spiraling out of control until months later we realize that we’ve eaten our guilty feelings and are way worse off from when we originally started the diet. At least thats how I feel. 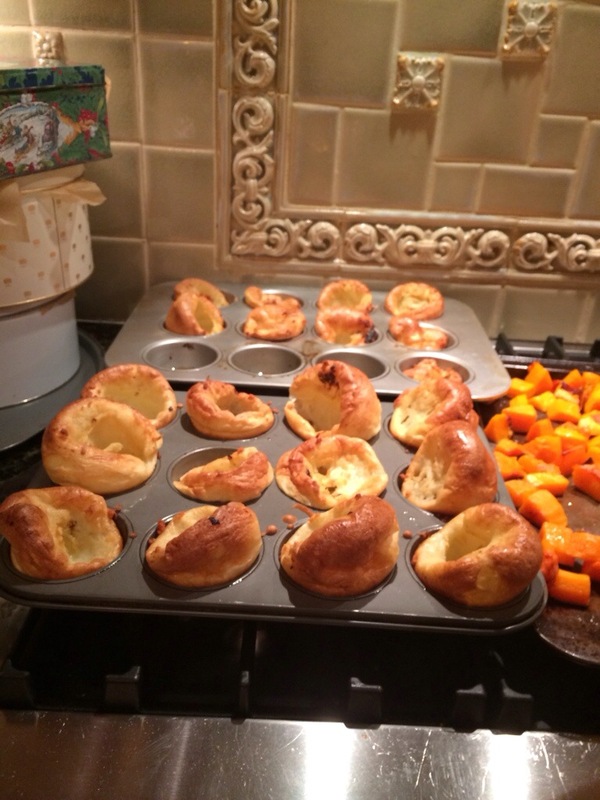 Traditional popovers and butternut squash. So I’m starting the revolutionary idea that I can indulge in super fatty, high calorie and generally ‘bad for you’ foods, just so long as I don’t consume the regret for those meals in my future dealings with food. Denial of food isn’t healthy, you’re not going to get anywhere with dieting if you’re just denying yourself. But have one cookie? Sure, just don’t eat the plate. This is my new philosophy that I hope will cary over into the New Year with this plan. Of course, I’m saying this now after three ridiculously heavy meals that I’m not doing anything to work off. And adding exercise into my routine is also going to start happening soon. Motivation for that part is slow goings tho. But, ultimately, I’m hoping this new philosophy on not feeling that overwhelming guilt the next day after a particularly large or high calorie meal, won’t take over my life. I’m writing this really trying to not feel that guilt. Because I shouldn’t have it. There is no shame in eating a high fat meal as long as it isn’t every day. At least that’s what I keep telling myself. Translating annoyance, aggravation, displeasure, exasperation, and irritation into motivation. "I've had my ups and downs, but I always find the inner strength to pull myself up. I was served lemons, but I made lemonade."